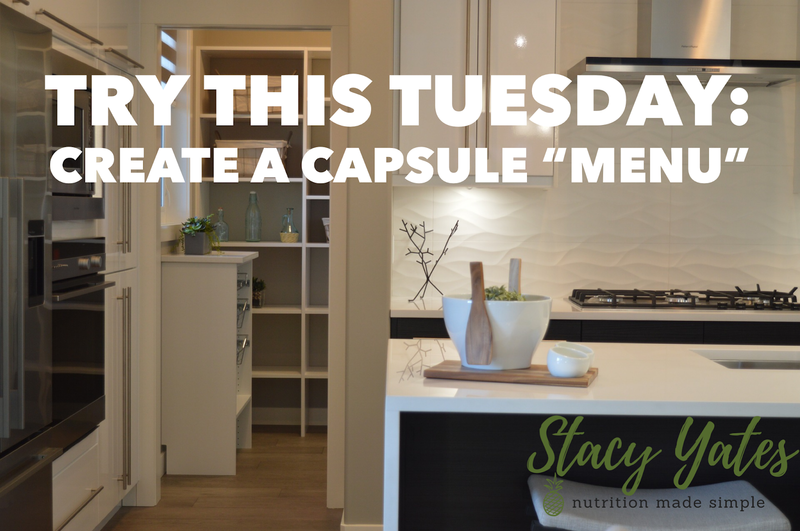 Try This Tuesday: Create a Capsule "Menu"
You’ve heard of capsule wardrobes, right? The idea is that you carefully and thoughtfully select pieces of clothing that you enjoy wearing, and yet are versatile enough to mix and match for the season. Basically, the whole idea is to keep it simple; know what you have; love what you have; don’t spend a fortune; and adjust with the seasons and weather! So why not use that same logic to create a capsule menu?? I know that in order for my clients to follow through with healthy eating, it needs to be kept simple! That means: no super-fancy meal plans to follow, not having to locate and buy 5 special ingredients for a dish that you may only make once (shout out to Gwyneth Paltrow and her beautiful yet highly complicated recipes hehe), and generally not having to overthink or overcomplicate things in your already complicated life. Here’s the thing: a capsule wardrobe only works because you are ok to wear some of the same things over again. You create variety within by coupling different pieces together to make a whole new outfit. It’s the same way with a capsule menu. Just be willing to mix-and-match and adjust with the season! (Bonus points if you’re also willing to eat “dinner” for “breakfast”). 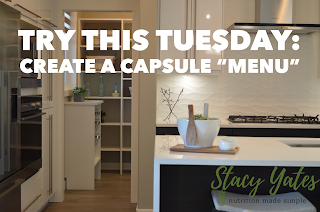 To me, a capsule menu just means that I am not recreating everything from scratch every night, that I am making larger batches for lunches and leftovers, and I am not over-analyzing my micronutrients. If you’d like some help creating your own capsule menu – please let me know. It’s easier than you might think! I decided to do things a bit different today. Instead of sharing oat facts, I’m going to tell you about how I prepare my oatmeal – it’s not at all boring! Adding some fats and/or protein to oats slows overall digestion and makes you feel satiated for even longer. I love the crunch of the nuts/seeds and the texture of the coconut. You can really do so many things with oatmeal, and the possible additions are endless: apples, pumpkin seeds, chia, hemp, coconut milk, peanut butter, berries, flaxseed, bananas, on and on! 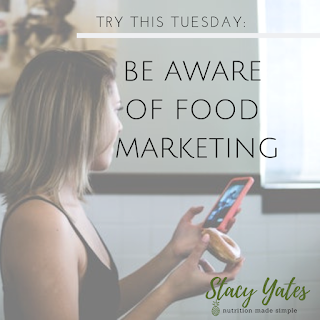 Remember to not add too much sweetener, keep the portions in check, and try to choose the less processed forms of oats (think steel cut rather than instant). What’s YOUR favorite oatmeal combo? Did you know? Oats contain beta-glucan, which is a soluble fiber. Soluble fiber forms a gel-like substance when mixed with water. It helps promote healthy gut bacteria; reduces LDL and total cholesterol; and keeps you feeling full for longer. Did you know? 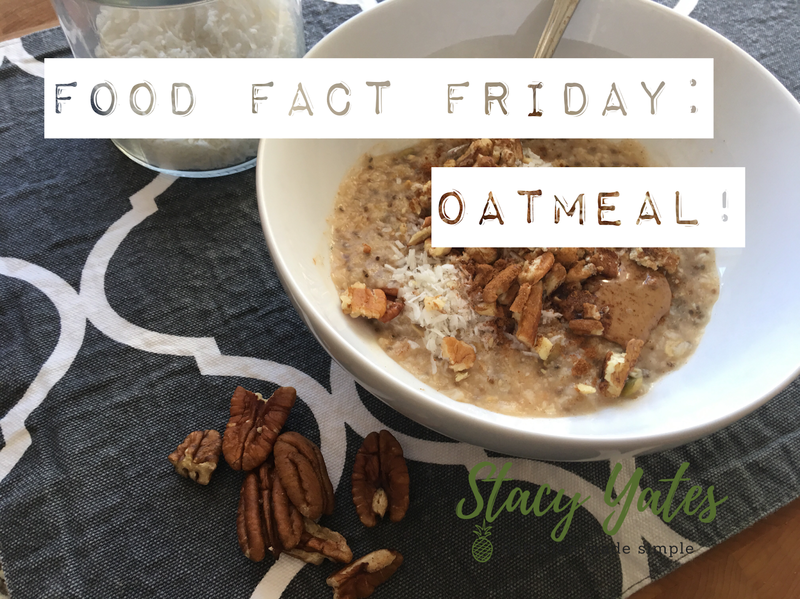 Oats contain good amounts of vitamins and minerals and are especially high in manganese (a mineral important in bone production). 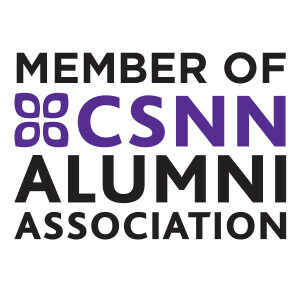 Have you heard of cassava? It’s a tuber (a starchy root vegetable) that is popular within the Paleo-community. It’s not a grain, yet it can be used to make things like crackers, chips and breads, which would typically be off-limit foods when eating on any grain-free diet. Cassava is grown in the tropical regions of the world. 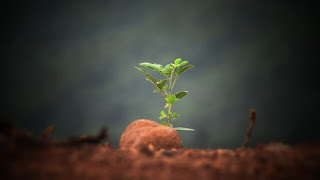 It is able to withstand difficult growing conditions, and is one of the most drought-tolerant crops. Although I faithfully promote (and eat) a diet consisting mostly of real food (unprocessed and unpackaged) I do like to try new foods that become available. Those of you who know me, know that one of my most favourite things to do when traveling to the USA is a "pilgrimage" to Whole Foods and Trader Joes, where I like to find items that are either unavailable or yet not released to us Canadians. *Cassava is high in resistant starch. (Remember we talked about resistant starch when we examined Tigernuts!?) You may recall, this type of starch is just what it sounds like: resistant to digestion. It passes through most of the small intestine, and then gets consumed by our microbiota in the large intestine. (Food that our healthy gut microbiome “consumes” is referred to a PRE-biotic). 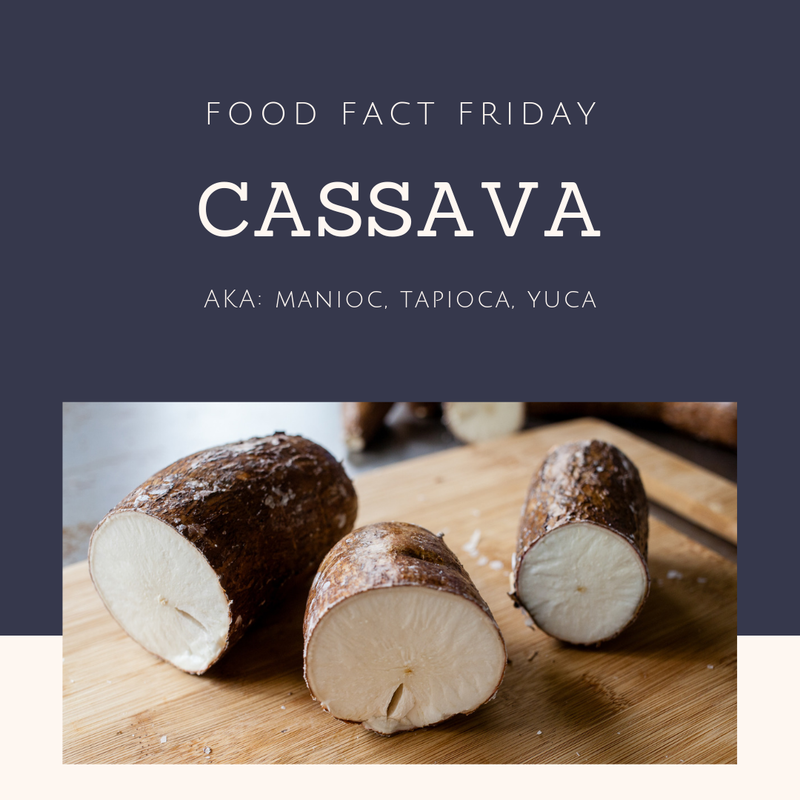 *Nutritionally speaking, cassava isn’t that special, and is actually higher in calories than other root vegetables like beets and sweet potatoes. *However, the fact that it’s higher in calories makes it an important crop for developing countries. As most of you know, the new Canada Food Guide came out recently. 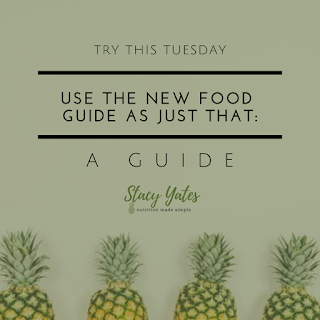 It’s a definite upgrade from the previous guide, and one of the best parts is the inclusion of holistic nutrition principals and behaviors like being mindful of your eating habits, cooking at home more often, enjoying your food, and eating your meals with others! 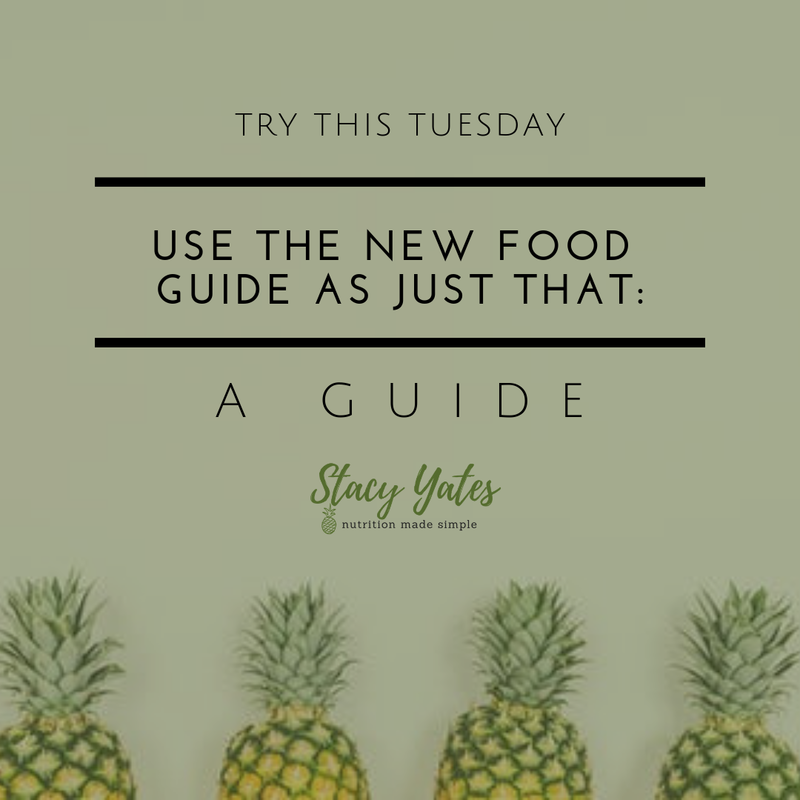 So often, we look at macronutrients to provide us with a perfect “style” of eating, but we fail to appreciate the importance of other factors like enjoying a beautiful home cooked meal with others instead of choking down a “healthy” meal that we don’t even like, while scrolling through IG on our phone – so mindlessly, that we’re somehow shocked when we’re done. Is it a perfect guide? NO. Is it an improvement? Definitely. At the end of the day, this is a GUIDE. It’s absolutely impossible to prescribe a diet that is perfect for 33 million people (nevermind 33 people)! You simply have to experiment on your own body and see what works best for you. For some people, no grains work best. Some people do better with animal proteins than plant-based proteins. Some people do best with higher fat diets. My advice is to use this as a GUIDE. Be your own guinea pig. Use some common sense. Do a little research. Tweak. Adjust. Enjoy. Still need help? Reach out. I'd love to help! Microgreens are the seedlings of edible vegetables and herbs. They result from the cotyledon stage of growth – when the first seed-leaves have fully expanded, but before the true leaves have emerged. Microgreens are not to be confused with sprouts though, as sprouts are germinating seeds. These tiny little leaves pack a real nutritional “punch”. What they lack in size, they make up in vital nutrients and intense flavor! (You’d be surprised just how flavorful one tiny leaf can be!) These little guys contain a wider variety of polyphenols and antioxidants than the matured leaves of the same plants. 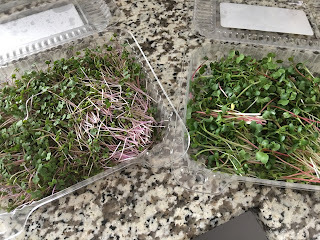 I recently ordered some kale and “salad mix” microgreens from a local small business and they were delicious. MicrogreenMommaYYC Rocco told me that there are still many types of microgreens that she hasn’t tried yet – but that her favorite so far is broccoli. 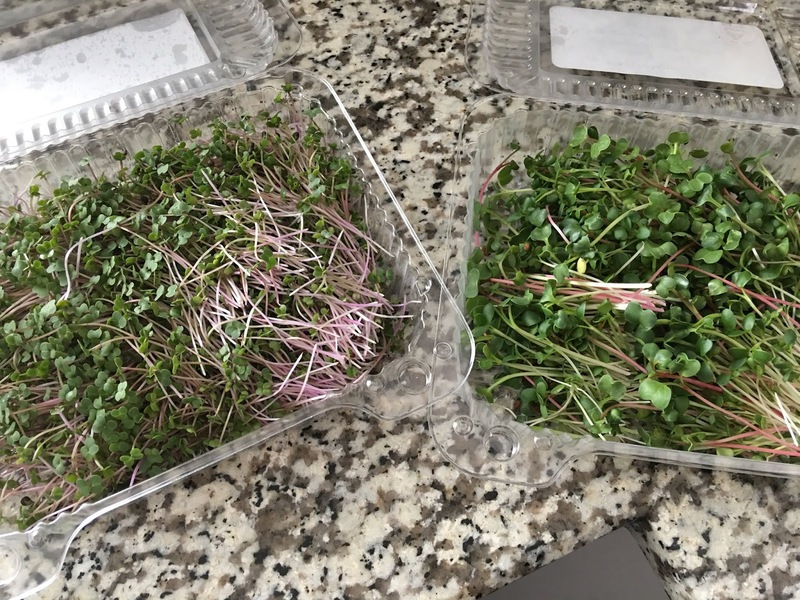 She says that broccoli microgreens start off sweet and end up with a mildly “spicy” aftertaste. They also have a tender yet crispy texture. 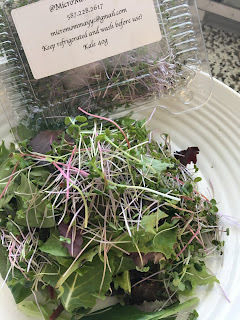 Microgreens are great in sandwiches, wraps, and many dishes you are already enjoying. 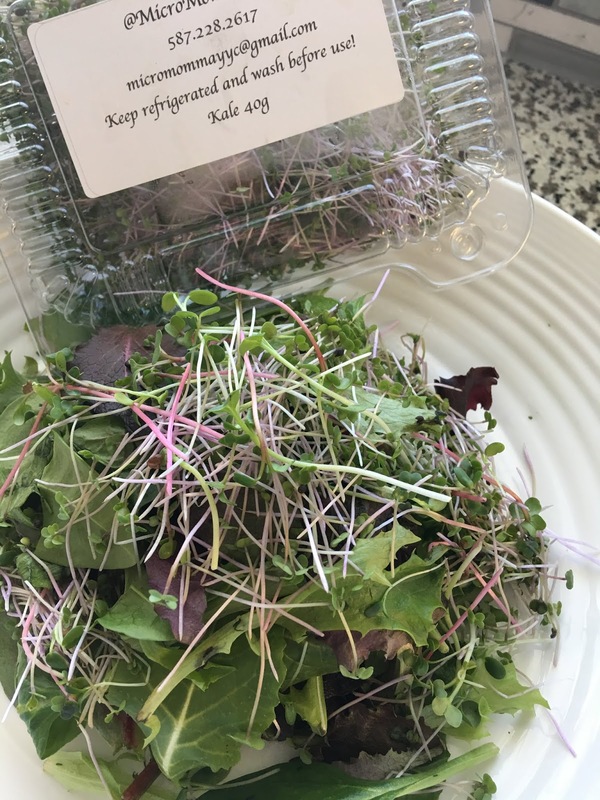 Adding a few microgreens to the top of any dish you are eating automatically increases nutritional density, flavor, color and texture! I personally love adding them to salads! If you’re in the Calgary area and would like to try some microgreens, send Rocco a message on IG or email her at micromommayyc@gmail.com. Delivery to the area is free! Did you know? Microgreens contain between 4-40X the nutritional density of the same plant leaves fully matured? Did you know? 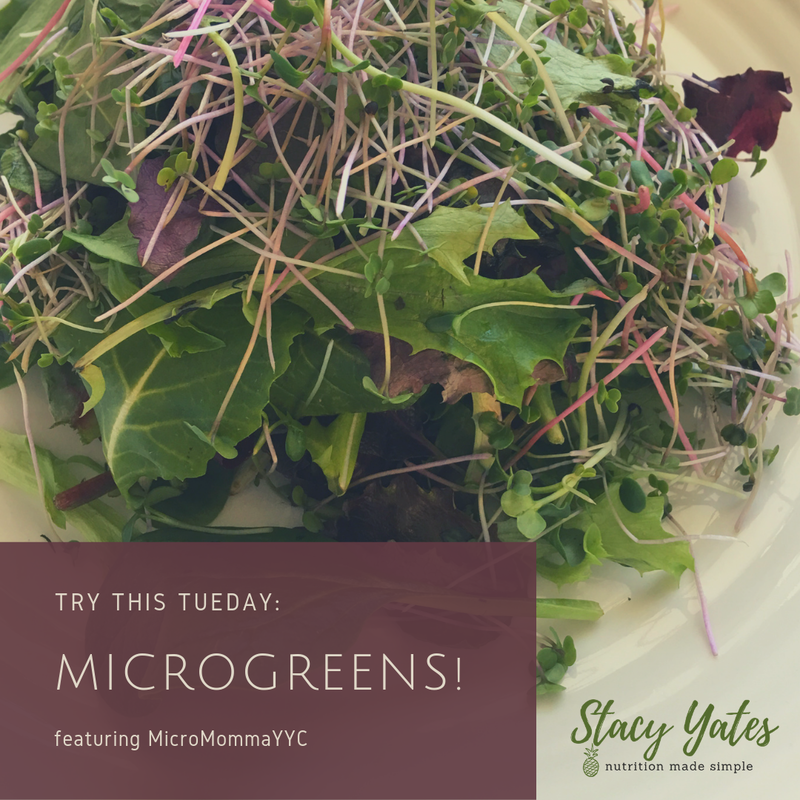 You can find so many different types of microgreens, such as mustard, kale, radish, cabbage, buckwheat, garlic, lettuce, beet, spinach and many more!